Sebaceous glands are small sebum-secreting glands connected to hair follicles in the skin. Sebaceous gland tumours might be benign such as sebaceous hyperplasia and sebaceous gland adenomas, or malignant such as sebaceous carcinoma. 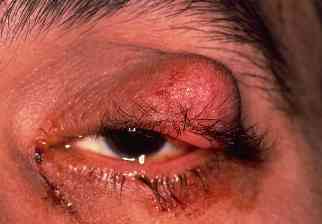 Sebaceous carcinoma is a rare, highly aggressive and lethal malignancy with a predilection for the periocular region. 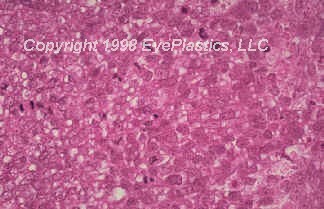 Most commonly, it involves meibomian glands of eyelids, leading to the terminology meibomian gland carcinoma. Other sebaceous gland-containing structures such as the caruncle, the glands of Zeis, and the eyebrows might be involved. Sebaceous cell carcinoma are notorious in masquerading as innocuous lesions like a chalazion or chronic blepharitis. It is locally invasive and readily spreads to regional lymph nodes. 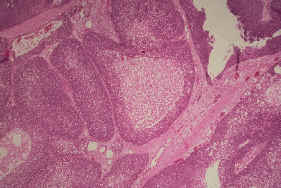 Histologic intraepithelial spread might be misdiagnosed as epithelial dysplasia or carcinoma in situ. Multiple conjunctival map biopsies might be performed to stage the disease. Lymph node biopsy might be needed to rule out distant metastasis. It might mimic Chalazion or chronic blepharoconjunctivitis.